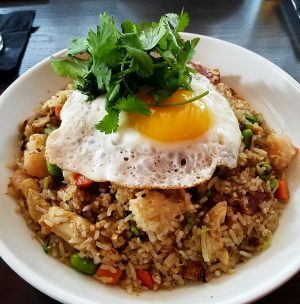 Out near W. Main Street in Durham we’ve seen a surge of new restaurants and one of the newest, is actually a classic old spot! 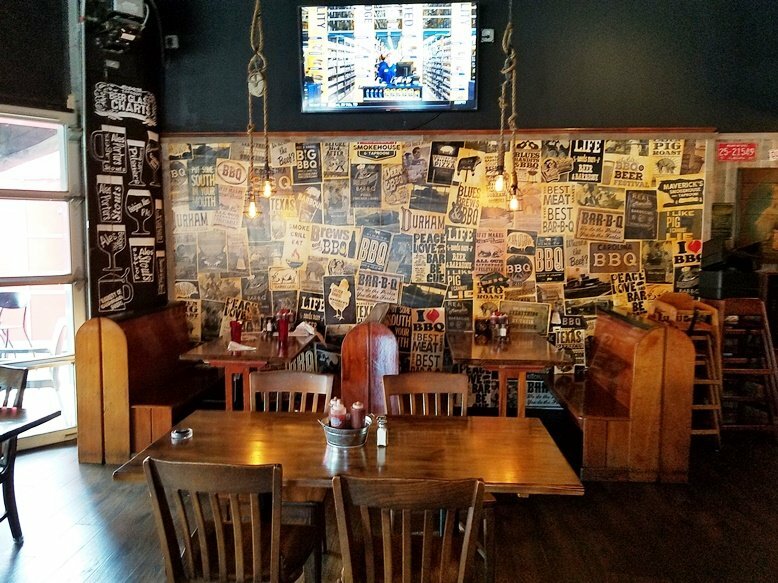 The new Maverick’s Smokehouse and Taproom sits in the old space that used to be Alivia’s Bistro, a favorite hang-out for locals. 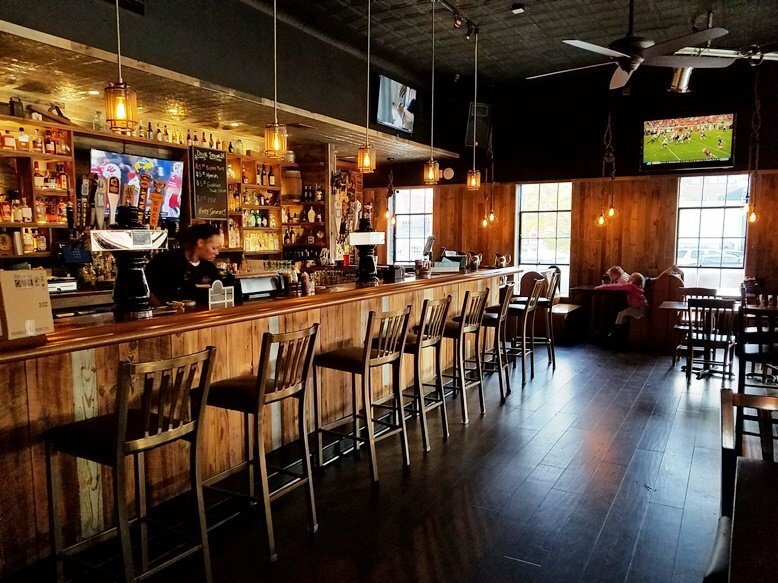 And while Alivia’s was always a decent option to stop in for a drink, the food was never that exciting which is why it was great to hear about the transition to barbeque and smoked meats. 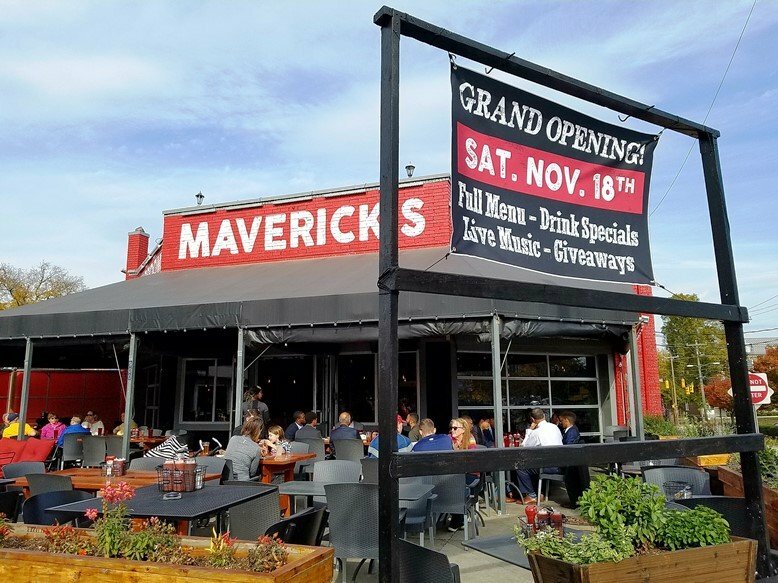 And thankfully a media invite to preview the new Maverick’s Smokehouse landing in my email inbox. Here’s what to expect when you visit! We’re handed over menus and I’m happy that Maverick’s Smokehouse covers most of the major meats: barbeque, brisket, Memphis-style ribs and chicken along with chicken and sausage, a veritable Southern barbeque meat-fest! Most meats come in sandwich or plate form along with a handful of starters, salads and 12 or so sides. The selection of entrees are in the $10 to $15 range so prices are very reasonable at Maverick’s Smokehouse. Our table orders up the deviled eggs, smoked charcuterie along with a variety of the meat plates for our entress, we are ready to eat! At each table are anodized tin pails with three barbeque sauces at the ready as your dining condiments. 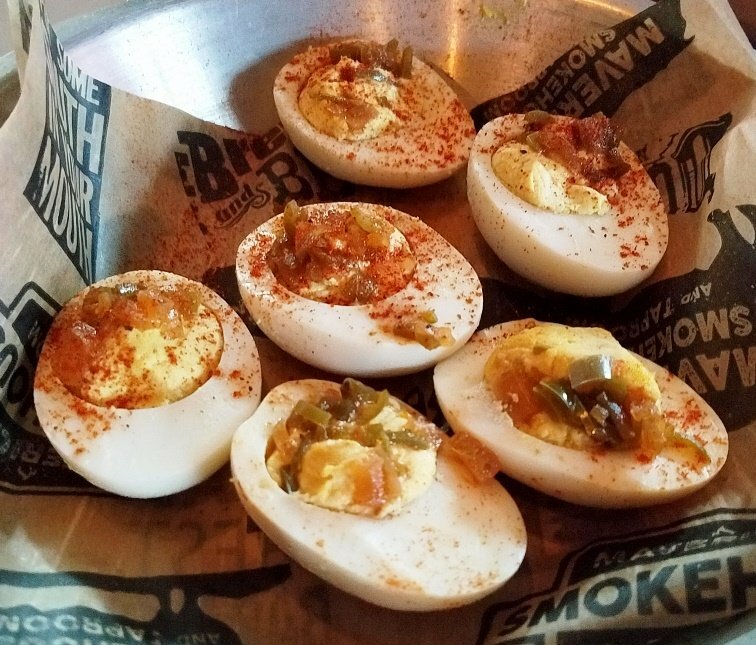 Our appetizers show up at the table and while the deviled eggs are nicely done, the smoked “charcuterie” plate is the big winner here! 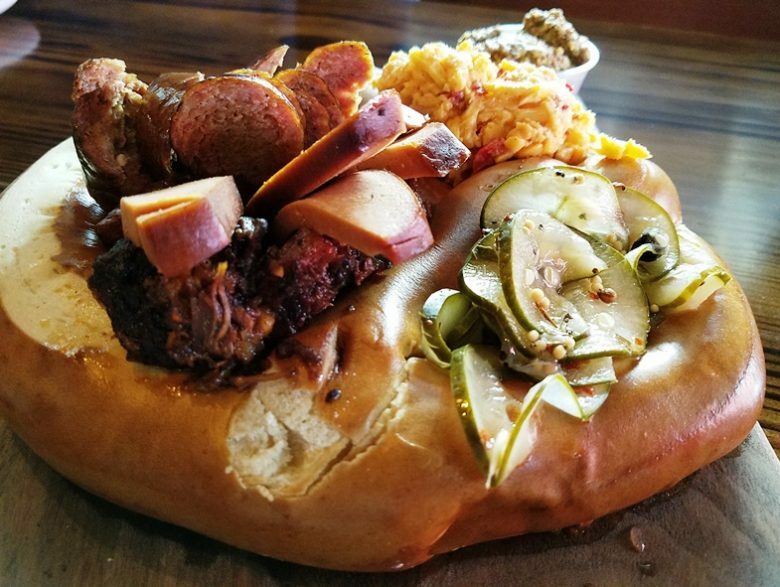 Served up in a HUGE pretzel baked in-house along with smoked sausage, savory bologna and tangy brisket. Along with some quick pickles, pimento cheese and whole-grain mustard, wow! 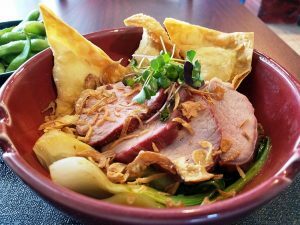 It’s definitely a looker of a plate and a great preview of the menu in one appetizer. Tear off some pretzel bread, add in a bit of pimento or mustard, choose your meat and you’ve got yourself a delicious snacek! For my entree I’ve gone with the beef shank special, succotash and potato salad with bacon. The shank is pulled off the bone and served in a red sauce, very tender and good mouth-feel due to all the connective tissue in this cut. The succotash was a bit over-cooked (I’d pass here) and the potato salad was super fresh with a speckling of salty bacon inside, very tasty. Oh and don’t miss the hush-puppies here! Nicely fried, substantial and with a hint of onion flavor. But I’d have to say the real winner at the table are the Memphis-rub ribs which can be ordered wet or dry. They are meaty pork ribs with a nice smoke ring around them. 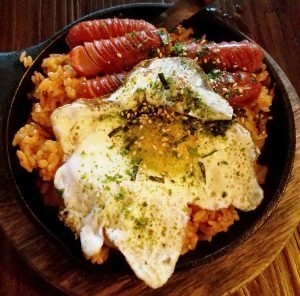 And paired with the generous sides, certainly a delicious and filling meal for most people. Maverick’s Smokehouse also offers up a decent selection of beers and cocktails to accompany your meal. Service was excellent throughout our visitl but not entirely a surprise given it was a media visit. So thank you Cameron (General Manager) for a very tasty visit to Durham’s newest smokehouse. Based upon the crowds, I’d have to say that the Bull City was hungrily awaiting your arrival and you’re off to a good start. 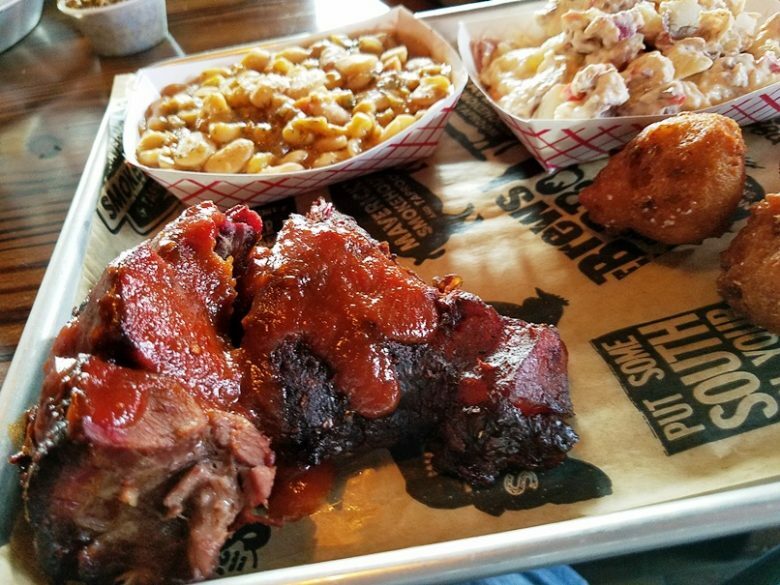 Solid smoked meats, fresh sides and decent prices seem to be the guidelines here. And oh yeah, that fantastic outdoor patio! 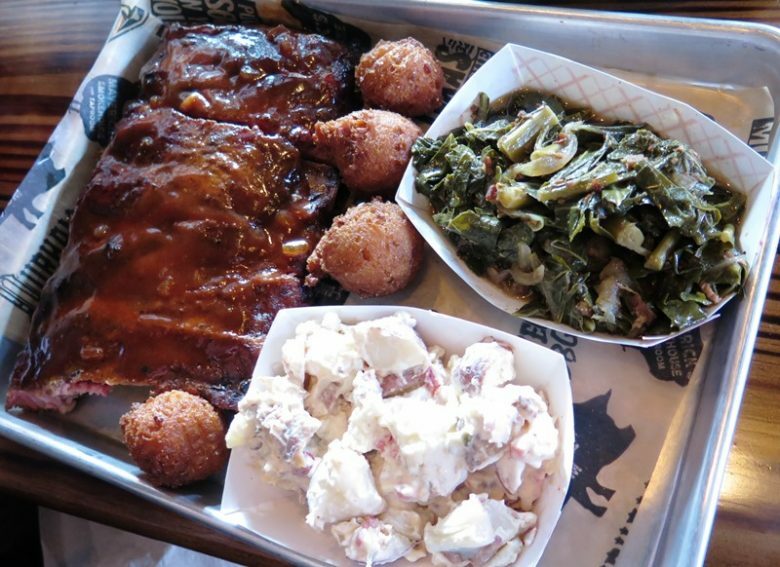 Can’t wait to visit when the weather warms up at Maverick’s Smokehouse and Taproom, bon appetit!